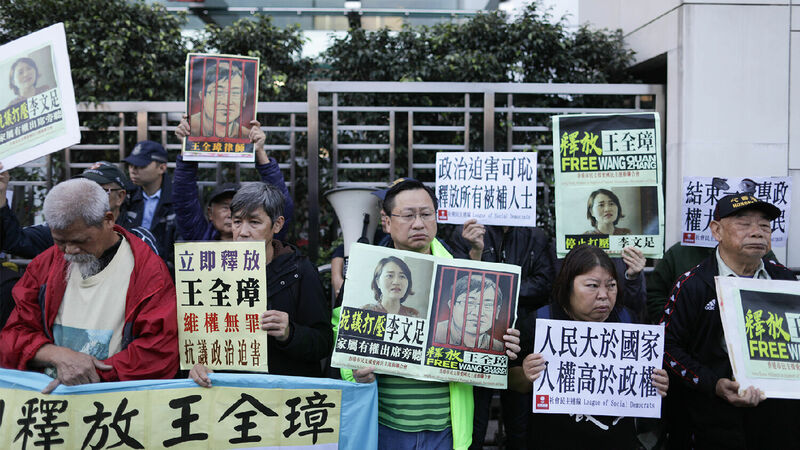 Protesters hold posters of Wang Quanzhang during a demonstration at the China Liaison Office in Hong Kong to protest the crackdown on human rights lawyers in China. The suppression of “dissent and political opposition” extends to anybody “advocating a change of government or government policies.” Anything that could be politically sensitive is censored. “[A]ny advocacy for Hong Kong’s independence or self-determination, even by non-violent means, threatens ‘national security’ and therefore is ‘illegal’ or does ‘not uphold the Basic Law,’” writes Amnesty. Several cases of restricting this “illegal” behavior occurred in 2018, with direct interference by China. On Oct. 26, 2018, Demosisto, a pro-self-determination political party in Hong Kong, announced that two of its members were detained by Chinese authorities in a trip to the mainland in March and August of that year. The pair reported being interrogated for hours over their affiliation with Demosisto. One of the members was reportedly held at an unofficial detention center, where the chance of torture and other abuses increases. Amnesty International–Hong Kong described this as “a chilling attempt” by Beijing to silence Hong Kong’s independence activists. But Hong Kong’s government did nothing to protect the rights of its citizens nor did it negotiate with China to prevent such an event from happening again. Also in 2018, the Hong Kong government officially banned the Hong Kong National Party “in the interests of national security, public safety, public order, and the protection of the rights and freedoms of others.” The party promotes Hong Kong independence from China. Any member or individual who acts in support of the party could face charges and imprisonment. In the name of upholding freedoms and rights, Hong Kong is squashing anything contrary to its policies, which are clearly dictated by China. These are just two examples of the political suppression that occurred during 2018. The report notes that the use of “sweeping references to ‘national security’ to silence dissenting voices is a tactic favored by repressive governments”—e.g., China. China carries out even worse human rights violations on the mainland, including making people disappear or detaining members of particular religious and political groups, or affiliated individuals, to camps in the Xinjiang province. China’s government also holds tight control over communications, the Internet, news media and education. It is dragging Hong Kong down the same path. Undoubtedly, China is behind these increasing crackdowns in Hong Kong as it seeks to bring the region more forcefully under its control. In Genesis 22:17, God promised to bless the descendants of Israel with “the gate of his enemies.” This refers specifically to sea gates, such as the Suez Canal, the Bab el-Mandeb, Sri Lanka, the Panama Canal and Hong Kong. All of these, and many more, were once controlled by the U.S. or Britain, contributing to their superpower status. Now, in direct fulfillment of Deuteronomy 28:52, Britain and America have lost control of these sea gates. Those who now control them will use them to “besiege [Israel] in all thy gates.” America’s and Britain’s loss of these sea gates, including Hong Kong, will soon be used against them to bring about their downfall. China now controls the majority of these sea gates. China is tightening its stranglehold over Hong Kong and casting its net around the world, especially through its Belt and Road Initiative. Hong Kong’s autonomy, and that of much of the world, is threatened by China’s rise. The Bible prophesies that China will rise to superpower status to join what Revelation 16:12 calls “the kings of the east.” Russia will ultimately be at the head of this alliance, and China will be in a position of leadership directly under it, as Ezekiel 38 reveals. This terrifying military alliance of multiple Asian nations will wield a massive 200 million-man army (Revelation 9:16). China’s expanded control in Hong Kong and around the world will soon wreak havoc as it seeks global dominance. For more information on China’s prophesied rise, please read our free booklet Russia and China in Prophecy.